Here is a theme that I made for the Dance School my girls attend. 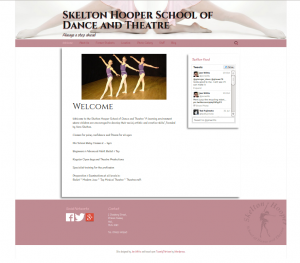 They previously had a website which did not have a CMS behind it and as such became very hard for the Dance School to update. I used the WordPress TwentyThirteen theme as my starting point for this theme and built my customisations up from there. It is a fully responsive theme, so works just as well on a small phone screen as it does on a large desktop monitor. The theme picks up the CSS and handles the logos and placement of everything else. The twitter widget on the right is just another custom HTML widget and the code to get the Twitter stream is created in your Twitter account under “Settings > Widgets”.